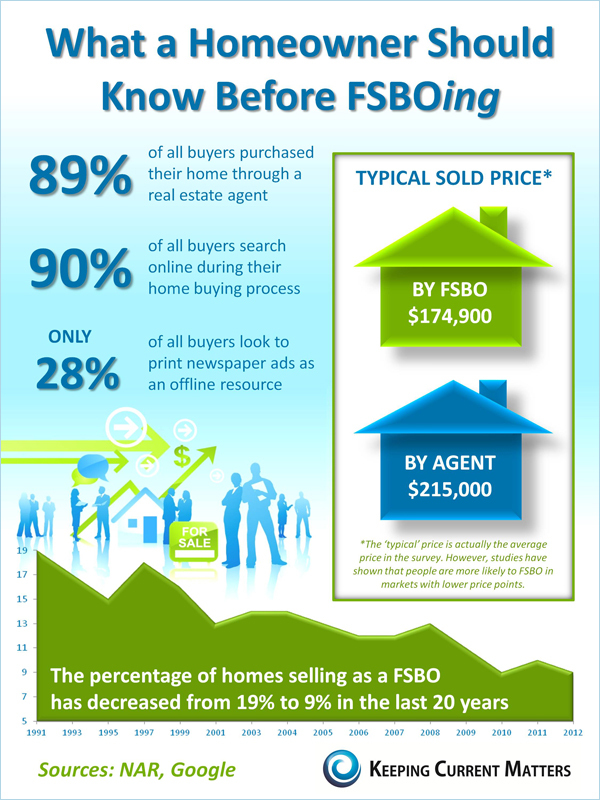 Interesting facts to consider when deciding to sell your home yourself (FSBO) vs. hiring a professional agent. What every homeowner should know BEFORE FSBOing (listing your house on your own). – 89% of all buyers purchased their home through a real estate agent. – 90% of all buyers search online during their home buying process. ONLY 28% of all buyers look to print newspaper ads as an offline resource. Why these stats matter: Numbers never lie, and the overwhelming truth here is that by hiring a Real Estate Professional you are ensuring that your property gets both the maximum exposure to the market, as well as the highest possible price.